we were traveling on the edge of the hills along a zigzag path to a town next to Nagcarlan. little did we know that we were already on the foot of one the country's most sacred mountain. Mount Banahaw. we reached a town which rarely experience a sunny day out of the summer season. known to many as the sandal and shoe capital of the province of Laguna. this is the small highland town of Liliw. a short walk away from the shoe avenue is a beautiful brick church, which occupies a large flat area of the town. the foundation of the church was built as early as 1635 making stand there for over 300years now. a damaged part of the structure is still evident on its bell tower. one can appreciate its facade brick by brick. it has kept its aura as a brick church even in its interior. 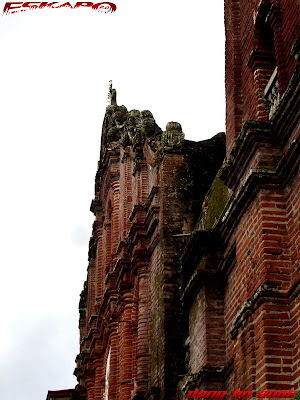 you will be surrounded by thousands of red piled bricks forming the church walls. the church altar was under repair when we were there. we were able to use the church meeting room for praying which was our main purpose there. there's also a prayer room beside the church where one can offer petitions. outside the church is a big parking space fit for the town. a beautiful view can be taken just infront of the church. as noticed by Theonoski, the church cross here is the same as the cross of the chapel of the underground cemetery. something that i didn't notice. special thanks to Theonoski for driving us going there along with travel buddy Orlan, Marvin, JC, Dan, Luke and Ian. 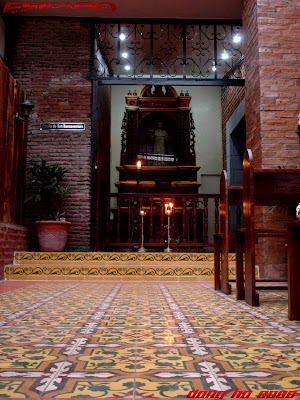 [what you shouldn't miss there]>>> the whole church structure made up of bricks and a small prayer room perfectly suited for silent personal prayer. Yahoo. Na first honor din. Ganda ng church dom, ancient feel yet parang modern din ang dating. This building has a fantastic red exterior! nice church! i like the color! a must-buy in liliw: sandals, uraro and putoseko!! I also took photos of this church. And also almost all of the saints images located outside. It's ancient and elegant. i see you're getting a head start on your visita iglesia! kakaiba talaga ang aura ng isang place kapag nagiging historical na ano?parang it has a very deep sentimental value that we really preserve each damaged piece of it. Fine images of a really splendid church, Dong. I see in the middle of the facade a white panel which probably represents the Baptism, doesn't it? Wow, very unique church! This is the first I've seen a church entirely made of bricks. >lawstude, ganda talaga niyan. medyo may pagkamodern na rin. may prize daw dapat ang mga first honor. >r-yo, yes. 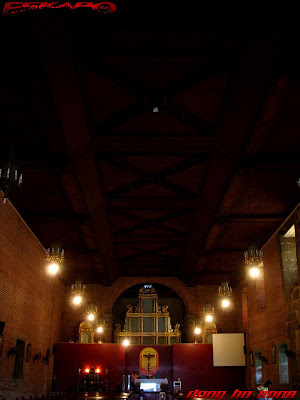 paborito ko ang mga red brick church. 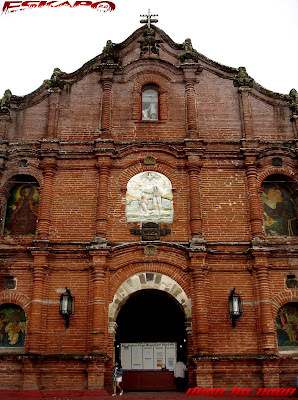 there's a number of churches that uses red bricks in the philippines. >theonoski, i agree! uraro is my favorite. >witsandnuts, nice. yes there are a lot of images of saints in its plaza. >hi faery, i've never been to that part of banahaw. the closest ive been to banahaw is just liliw and lucban. im sure you had a great experience there. yes. just in time to begin the visita iglesia. >hi nyl, thats true. it makes you value more when you know that it survived from years and years of tragedies and battles. >pietro, wow! i didnt notice that much. looks like you got it. >hi andy, yes. usually other churches only have a part of it made up of red bricks. 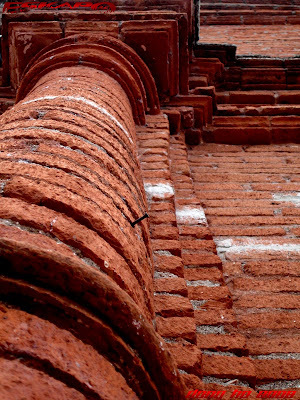 nice authentic bricks...reminds me of a church in ilocos. :) i must go there...for the sandals. hehe...jk...for visita iglesia as well. love your perspective of the pillar. beautiful facade, too. old brick churches are simply magnificent. ito ang inaabangan ko sa mga shot mo dong, ang mga old building.ito kasi ang hilig ko ang magbasa at malaman ang structura mula nuon hanggang kasalukuyan. ang ganda ng interior! gusto ko ang kulay..
bilib ako sa mga shots mo dong, gusto ko na tuloy mag photo walk ulit. Wow very beautiful church. Love the red bricks. My old apartment used to have red bricks too but have since been tored down, a real pity. >kunthan, thanks! ill drop by. >hi reena, what church is that? id like to see that too. sandals and uraro. you should try uraro. >hi luna, thanks! i too like red brick structures. it's just too picturesque. >raft3r, tama ka nga. hehehe... kakatuwa ka. >ever, salamat. bihira nga lang ako magpost ng mga structures pero nakakaktuwang malaman na may mga nagaabang sa mga ganitong post. salamat. salamat. >eben, salamat! ayos nga ang photo walk. byahe na. 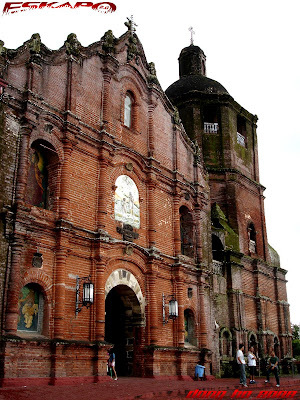 >borneo, you should visit the philippines and youll find a number of old churches here. >hi alicesg, that's sad. but having a new home is definitely be better. >kegler, hindi ko alam yon ah. astig nga ang mga red brick structures. That's such a beautiful church. Your photographs are so great at showing it to us. 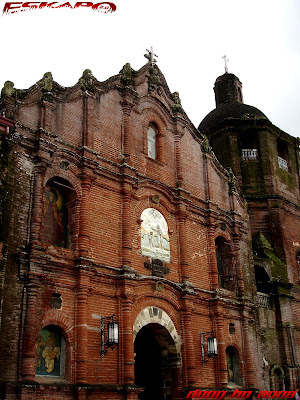 dame palang old churches jan sa Laguna.. religious din ba mga locals jan? I love brick buildings, now I see a brick church. Lam mo with the Phil in the earthquake belt, I hope that the church doesn't get destroyed by a shake. Usually di ba bricks are easy to fall and break? That church looks very imposing. spooky yung mga nitso dun sa previous post mo pero napaka mysteryoso ata ng lugar na yon pero looks interesting. Ganda nga ng church na ito. madalang lang ang mga church na gawa sa red bricks. parang kasing laki ng simbahan namin dito kaso not made from red bricks. hanggang ngayon di ko pa nakuhanan ng photos ang simbahan namin dito wala pa akong time. Sarap nga mag bisita iglesia. i wish makapagbisita iglesia ako these coming lenten season..
ganda pala ng church jan. i like the color. What a magnificent looking red brick church! It amazes me that a brick structure can have such fluid lines. Thanks for these images, and thanks for stopping by my blog. This building has it's history and look great. ang hitek ng camera oh! hehehe! I'm constantly amazed by the beautiful architecture and buildings in the Philippines. You obviously have a rich history and culture which has been lost to many people. I wish to explore the Philippines one day. >hi cindy, that's true. i actually wonder how they built all these in almost all the major areas in the philippines. >hi chyng, dami talaga. isa to sa mga probinsiyang maraming nag vivisita iglesia. >hi photocache, that's true. these wonders are really in danger. i hope they continue to survive the test of time. >hi joy, it sure is. >hi justkyut, dami ding magagandang simbahan diyan. sana nga mapost mo rin sa blog mo. tamang tama siguro sa lent. update kita kung kailan ako ulit makakaakyat. >hi reena, hehehe... kulit. pwede na rin. >hi blue rose, dami pang maganda around laguna. you need to explore. >greg, kaya pala wala ng update doon. update ko na lang tong link. belated happy birthday. debut mo na pala. >hi missy, my pleasure to bring you to places like this. 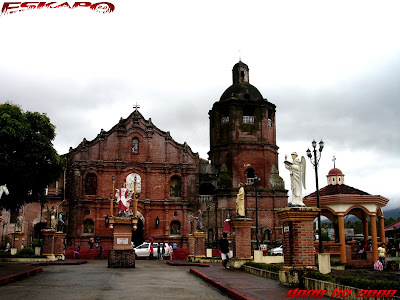 the church name is st john the baptist church or simply liliw church. >uncleawang, it has survived thru time. >punky, ah... luma na nga to. >karmi, buti nga talaga at na preserve. magaling yung mga humawak doon. >eastcoastlife, truly rich and diverse. you should visit us soon. How can i be link helper in your site? Now that's very unusual for the Philippines! Amazing. I love old churches and you have perfectly captured its beauty. a really clasic architecture,even with the red brick color makes the church stand out.the color reminded me a lot of a building in malacca called Studhuys. p.si bet u've already knew the meaning to that word,right? Wow! Great pics here. I love the first and the last one. I'm from Laguna but I haven't been to this church yet. Probably go there one of these days. Kudos! kakaiba nga yung exterior nya kuya dong. and i noticed unique din yung bricks na ginamit sa simabahan. one of the most beautiful churches you've featured! The whole view of the place is fantastic! Great detail of the red wall too! And again, it's coloured Fierce RED externally. Nice one Dong! well kept and really beautiful despite of the Church's age! beautiful captures! We spent many summers in Laguna when we were young, but I don't remember ever going to Liliw. What's wrong with me?! Again, nice photos. I'll add you in my blog roll. I specially love your photos of monuments. Ganda ng mga kuha mo. Iba talaga pag gawa sa bricks. I think its color makes it stand out. Reminds me of the red-brick ruins in Fort Santiago. Great photo of the floor tiles. I went to Liliw last year, so I had a chance to visit that really old crypt on your earlier post and this church before I went shopping for some sandals and bags for my wife. That town is amazing, I enjoyed the experience... it's very similar to the small mountain prefectures in Japan. Saka meron palang sikat na Italian restaurant sa Liliw. It's under a house, sobrang baba ng ceiling I had to stoop really low to get around. Did you get a chance to eat there? Forgot the name of the resto, pero it's really popular daw, daming tao kumakain eh. That's a beautiful church. I like old brick structures. I've been to Liliw before but sadly I haven't been to this church. I'll keep it in mind on my next visit.